In celebration of the 4th of July, here is an adorable quilt which we saw at a recent quilt show. These kids are all dressed up for the parade, and they have brought along their cat, teddy bear, and a dalmatian puppy in a red wagon. The inscription reads: "If it weren't for the brave, there'd be no land of the free." Barbara explains: "I saw the quilt hanging at ThimbleCreek last year and had to make it. Hand appliqued and machine quilted, it represents my grandchildren. It reminds me of watching the 4th of July parade as a young child. The pattern is by [Holly Mabutas] at Eat Cake Graphics." 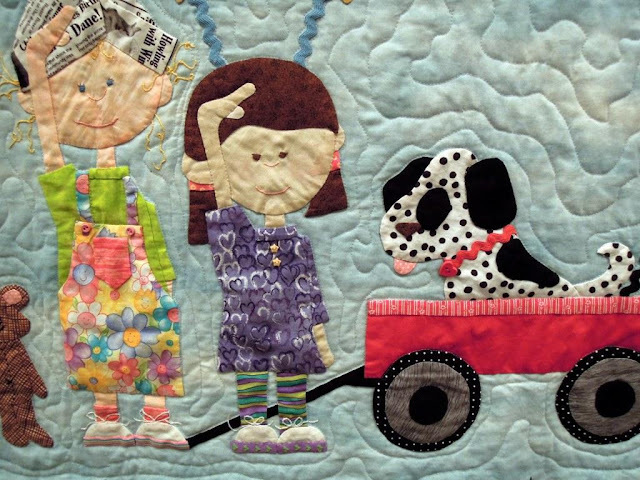 We love the incredible detail, including the fabrics in the kids' clothing, the embroidery details, and the dalmatian with its rick-rack collar. Barbara chose to decorate the border with big colorful stars, which really enhance the quilt. Image credits: Photos are by Quilt Inspiration. 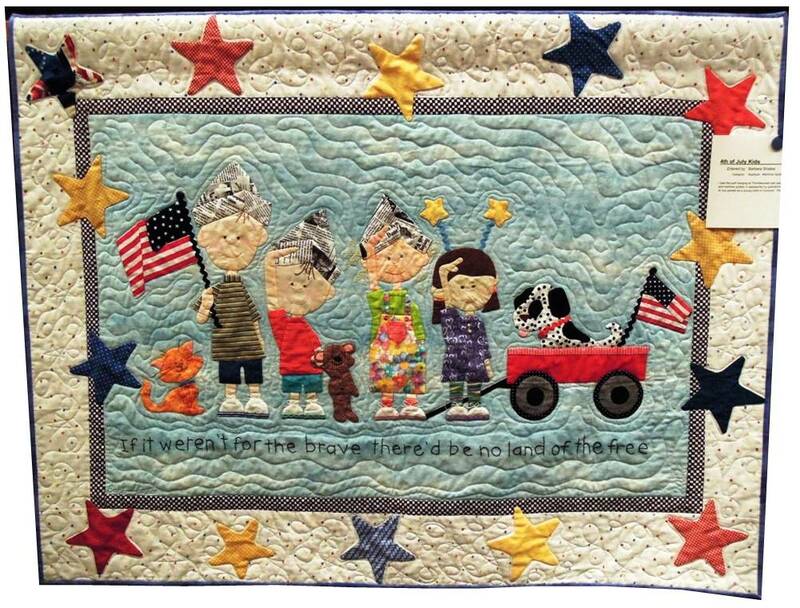 What a delightful quilt and so perfect for our country's freedom day! Way cute! Love the newspaper hats! I love your quilt. I've had the pattern for some time, but have been afraid to start it. Thanks for sharing your quilt. You give me inspiration. Wow, just beauiful! Thanks for sharing!